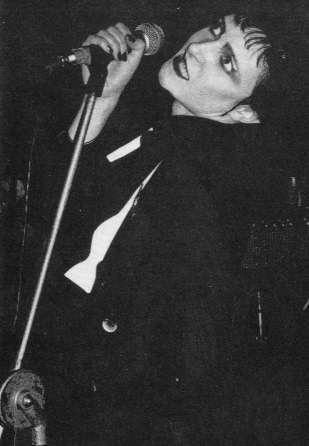 Siouxsie And The Banshees & the Violators play at the last Roxy gig promoted by Andy Czezowski tonight. The Roxy Club is in trouble. In setting up the Roxy, manager Andy Czezowski agreed to the appallingly large sum of £25,000 a year to lease the club. He's not been paying the piper and the predominantly Punk mecca is about to stop. The owner of the club has him physically thrown out the front door. Andy's involvement with the club is at an end. "Most punks were sexless, grey. Blank generation - nonsense. Dole queue martyrdom - nonsense. I just wanted to react against it." 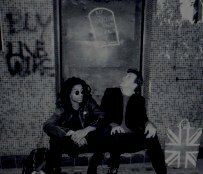 and The Stukas play The Marquee, 90 Wardour Street, London W1 tonight. John Cale, The Count Bishops, The Boys play Birmingham Barbarellas tonight. One of The first noted 45s to emerge from the home-made department. 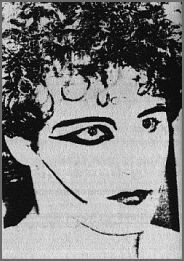 The Desperate Bycycles were not musically aligned to the punk/new wave movement (in fact not musically in sympathy with very much at all), the group's 'Smokescreen' is however something of a Van Gogh among vinyl valiants. DESPERATE BICYCLES are strictly D.I.Y. (Do It Yourself). The band was formed in March of this year "specifically for the purpose of recording and releasing a single on their own label. They booked a studio in Dalston for three hours and with a lot of courage and a little rehearsal they recorded "Smokescreen" and "Handlebars." Total cost of the studio, single and printing was £153. They cut the tracks back in April 76 and the wait's finally over. It's released on their own Refill Records label. It is such a budget operation that the sleeve is a photostat of a Bicycle Wheel printed on one side only; the single has only one printed label on one side and the two tracks on the' "A" side are repeated on the flip. "Smokescreen.. .leaps at the throat," as the band put it. There is a limited edition of 500 copies, with the potential of being re-pressed if it sells. 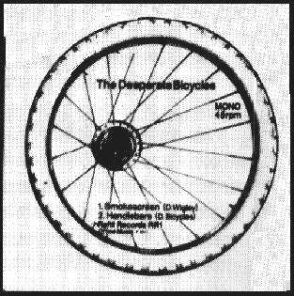 At this recording, the Desperate Bicycles are Danny Wigley on vocals, Nicky Stephens on keyboards, Roger on bass, plus an unnamed guitarist and drummer. They call themselves the "Desperate" Bicycles because they're desperate for equipment. Besides the keyboards and bass, they have to depend on what the studio has lying about.